This New Oh My Disney Swim Collection Will Make '90s Disney Kids Scream, "My Heart!" Hey friends! The Disney Store and shopDisney just launched its latest line from Oh My Disney called "OMD Swim." 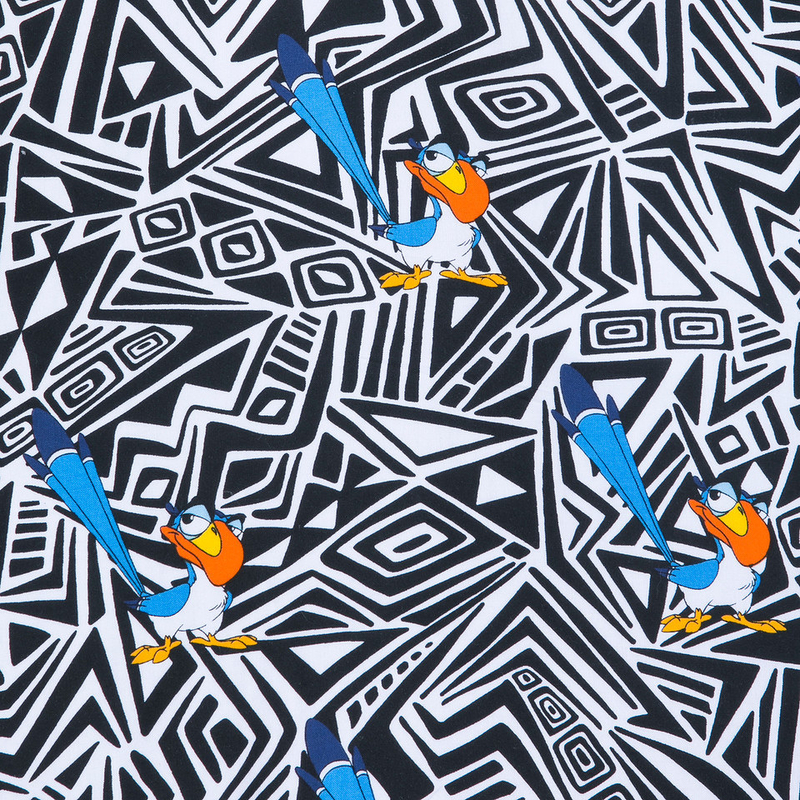 This magical collection features swimwear and outdoor accessories inspired by The Lion King, Aladdin, and Mickey Mouse himself. And, YEAH, they're here just in time for you to celebrate the live-action versions of your fav childhood films coming out later this year! 1. 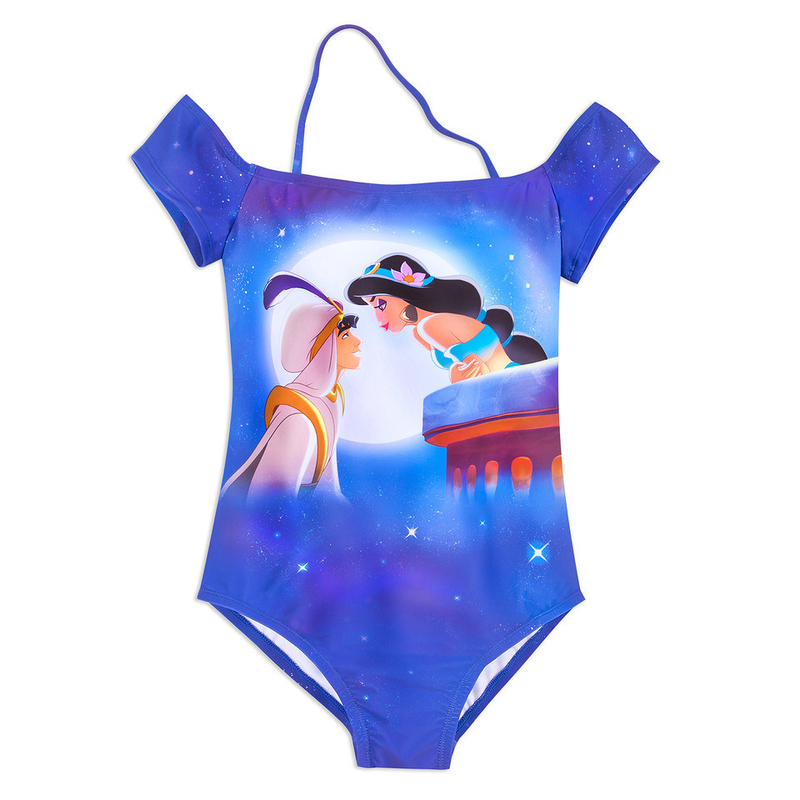 Like this wish-worthy one-piece Aladdin swimsuit. Off-the-shoulder sleeves and a starry skied scene make this suit both dramatic and playful. Get it from shopDisney or Disney Stores for $49.95. 2. 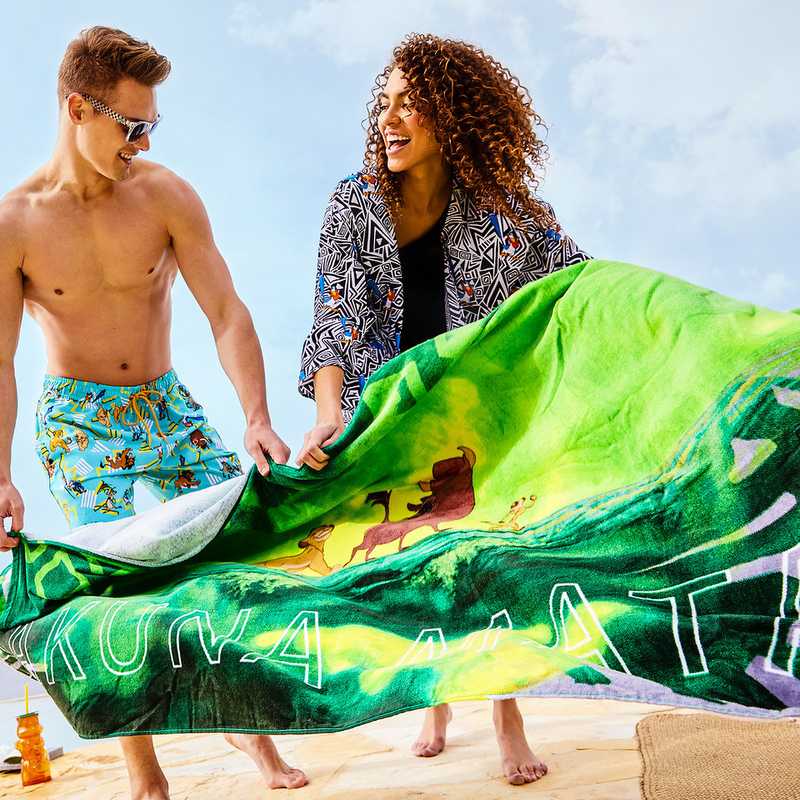 This incredibly clever Magic Carpet Beach Towel to lie down and dream about a whole new world on. Made of soft plush fabrication and accented by comer tassels, of course. Get it from shopDisney or Disney Stores for $19.95. 3. This Aladdin Magic Carpet Pool Float that looks like it's ~flying~ above the water. Look at Abu hanging on the edge! Get it from shopDisney or Disney Stores for $59.95. 4. These sequined-topped Jasmine slides fit for a princess. Jasmine anticipates "a sky full of possibilities" on the curved soles of these slip-on sandals featuring a cushioned upper. Get them from shopDisney or Disney Stores for $22.95. 5. These large cat-eye Aladdin-inspired sunglasses that are shining, shimmering, and splendid. With gradient color, subtle glitter and Genie lamp accents, these shades are a wish come true. 6. This Aladdin-inspired Swim Tote that's a whole new world when it comes to packing. A clear PVC layer covers the underlying image of Jasmine, Aladdin, and Agrabah on this spacious bag that has two drain holes for your wet swimwear. Get it form shopDisney or Disney Stores for $24.95. 7. 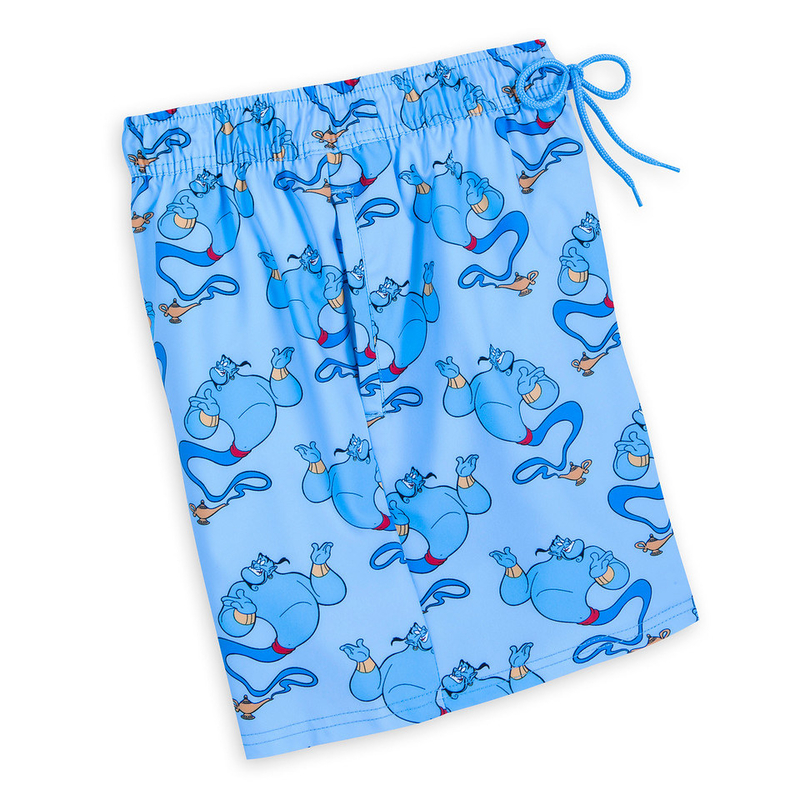 Direct from the lamp your wish comes true with these Genie-print Swim Trunks. These adorable swim trunks feature a drawstring tie and side pockets. Get it from shopDisney or Disney Stores for $42.95. 8. This cute AF kimono-style The Lion King Cover-Up. Features a flowing fit, lightweight feel, and everyone's favorite red-billed hornbill Zazu! 9. 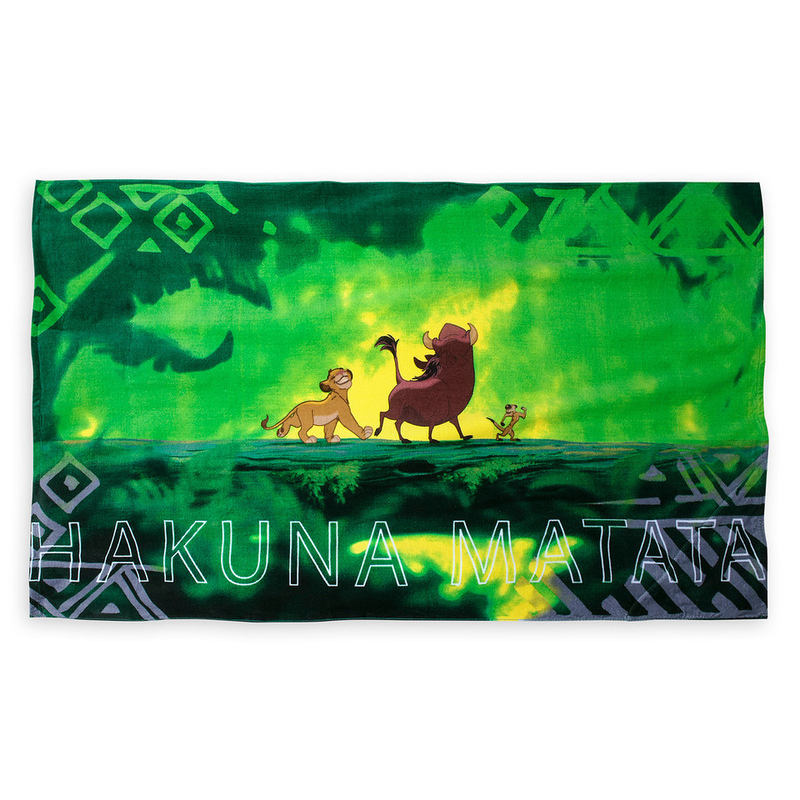 This throwback The Lion King Hakuna Matata Beach Towel to help you live problem-free. The terry knit back is perfect for drying off after a dip in the pool. 10. This very unique The Lion King Figural Tumbler fit for a king. Shaped like a honey jar complete with Timon, Simba and Pumbaa stacked vertically, this tumbler ain't no passing craze. Get it from shopDisney or Disney Stores for $16.95. 11. These The Lion King Slides to help you rule the beach. Featuring your faves Simba and Scar. 12. This ~wildly~ cozy long-sleeve Spirit Jersey inspired by The Lion King. Simba, Timon, and Pumbaa silhouettes take the spotlight on front with "Pride Lands Since 1994" puff ink text on back. 13. These bright, bold, and adorable The Lion King Swim Trunks that look straight out of the '90s. Featuring side pockets and full lining, and are perfect for kicking back at the pool and contemplating a problem-free philosophy. Get it form shopDisney or Disney Stores for $42.95. 14. This silver women's Mickey Mouse swimsuit fit for a star. Featuring low scoop necklines paired with Mickey artwork and accented with a metallic sheen. 15. This vintage-era Mickey Towel that will make you the center of attention. This soft cotton terry towel features Mickey from his movie debut in 1928. 16. These Mickey Mouse Slides to help you a stylish stroll around the pool. These comfy slip-ons ffeature a textured sole and cushioned upper. 17. These throwback Mickey Mouse Sunglasses to help you keep your eyes on the prize. Featuring square frames with gray lenses and checker print arms. Get them from shopDisney or Disney Stores for $19.95. 18. This Mickey Mouse Disco Ball Tumbler that's perfect for dancing and drinking at the same time. This adorable tumbler comes with a straw and features Mickey's iconic ears. 19. 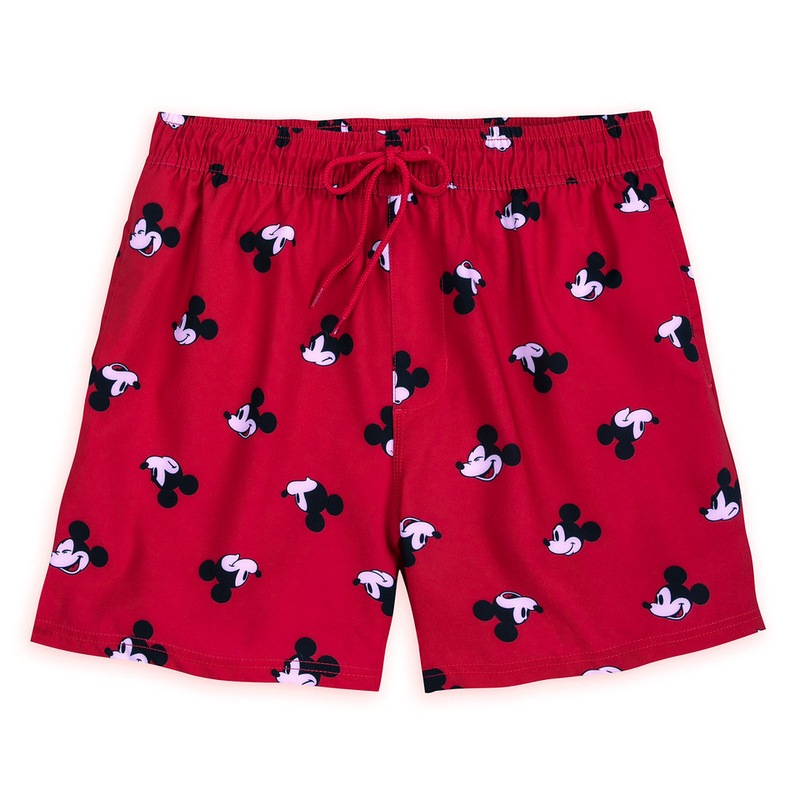 These simple, but sweet, Mickey Mouse Swim Trunks in a classic print. Featuring side pockets and a drawstring tie. 20. And finally, this Mickey Mouse Waterproof Phone Holder that's practical AND cute. You can talk, text, take photos, and shoot video in and even under the water. Get it from shopDisney or Disney Stores for $12.95.